BUT IT'S NEVER QUITE LARGE ENOUGH... I baste half of the quilt at a time as suggested by Harriet Hargrave in her book...she uses clamps on the sides but my counter tops are not the right size for ANY of the commercial clamps. I've tried putting tables together but then there's the gap between the tables that can cause a lump on the back...ASK ME HOW I KNOW THAT? I just wish I could observe some of YOU putting YOUR quilts together so I could come up with the perfect plan. HOW DO YOU PUT HUMPTY DUMPTY BACK TOGETHER AGAIN???? 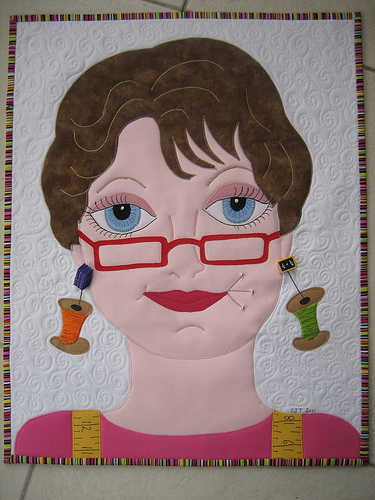 Any suggestions to make this side of quilting more palatable?? If its a big quilt, it automatically goes to a long armer. If its smaller, I have found that spray basting both the batting and the fabrics holds it together enough that I rarely use pins. Then I start sewing at the top and make sure I smooth the back as I go along. Not sure this helps but I hate the pinning part as well. I use my one portable banquet table and depending on size - do it in halves or thirds (Harbor Freight - or any hardware dept - has larger opening clamps). I pin most of the time. BUT I much prefer to send large quilts to a long armer - they will even do a simple baste for you if you want to hand quilt or do the finishing quilting yourself. This is why I prefer hand quilting....it goes into the frames easily with no basting....lol. I am still machine quilting small quilts and it drives me crazy to baste those....I hope I can do as well as you if I ever ever get to the larger ones....good luck. Maybe get a large piece of cardboard for the tables that are together? Also, have you tried bed risers? Smooth each layer as you go with your large acrylic ruler. I like to lay it down, just as if cutting, and work out from the center. It really works wonders. Good Luck! The best basting I have been involved with is our auction quilt and that was group-basted. Perfect! no adjustments needed. I think the next best was putting it on a frame. Since I have scoliosis, back pain is a reminder that I am still alive, and I crawl around on the floor. Leaning over a table, I would have to pin the middle and sit to do the edges. I have read, I'm sorry I can't remember where, to secure the backing to your design wall. Spray and place batting on the sprayed area. Smooth and then take it to the ironing board and press. Return this part of the sandwich to the design wall, lay top on floor and spray and then place it on the sandwich smooth and press. I have never tried this but thought it might work. Just a suggestion. My back couldn't handle it either so I chose to get a longarm, but I know that is not for everyone. Best Wishes on solving the problem. It was good to meet you tonight at the farmers market, Jane! I don't have much advice about basting quilts, but it seems like a basting party (or at least one friend to help) would help time go faster :) I will enjoy browsing through here later on, and hope to meet up with you again soon! I also have this problem. If it is a large quilt I send it to a long arm, who will baste it for me. If I do it I have one of those long banquet tables. I start in the middle, tape down the backing add the batting then the top. I pin a few rows. Then fold it onto of itself, tape down the next section of backing, smooth over the batting and the top and pin. I do this over and over again. It works for me and I can sit and pin! Best of luck. I know your pain..... Smaller quilts (up to 2 mtrs) I can bast on the floor (Well, after reshuffeling furniture and threatening other occupants in the house A LOT). All that crouching and crawling doesn't stop the pains (back, legs, shoulders, but with loads of tape, it does keep the quilt nice and flat. The larger ones I also do in pieces on a big table. And there I have those nasty bumps and folds and crooked backing..... The last big one, I just started quilting in the middle and smoothed out the wrinkly bits in between quilting. A huge pain..... and still it was wrinkled. If you find out the best way to do this, make sure to scream about it! I would love to know..... Good luck! Looks like you have many answers for an age-old question! I usually make smaller projects and spray baste them. With a lap sized quilt, I lay the sandwich on the kitchen table, tape down the backing, and spread everything else on top, using lots of pins. Something larger goes to the machine quilter to quilt! In your Humpty Dumpty picture to get the table higher put PVC pipes on each leg. Our guild did this and we now have a great table with no bending and hurting our backs. Cut the pipe to the make the height you want the table to be and place each table leg in the center hole. It is amazing how solid the table feels. I use hairspray on my quilt batting and stick down the back first, this can be done in sections or on the floor. Then I turn it over and spray again for the top. It is best to lay the quilt top and bottom on the quilt, fold one side to the centre and then spray and smooth out the fabric working to one end and then to the other. I then add pins but mostly just enough to keep it together until I get around to FMQing it. I have never made a queen size quilt but double bed size and it worked fine for me. Hope this gives you some ideas. I have always taped mine to the kitchen floor. However I have 2 that are to big for the space I have! I also can no longer crawl on my knees as I have what we think is a bone spur and it is painful so I have to sit on my bottom, however it is not uncommon to find me lying across it! The last few Honeyman had also helped close the pins! I am anxious to read the answers...My mom suggested I use the "old fashioned " quilt frame. She is going to show my how to do it..I will let you know if it works. I am a spray baster. Where I live there is a clubhouse with a craft room. We just push a few tables together. Your scout patches quilt is wonderful. Great to be able to view the patches without looking in a shoe box on a shelf in the closet.